Some of you (actually, I hope most of you) know my Best of Barbecue products. In the last ten years we’ve developed more than 100 grilling tools, fuels, and flavors. Tools like the Lumatong (lighted tongs so you can see what you’re grilling at night); Grill Hoe (for configuring your charcoal); and the Ultimate Grill Brush (yeah, the super macho long-handled brush you see me use on Primal Grill.) Grilling fuels, ranging from fragrant Olive Wood Chunks to cabernet-scented Wine Barrel Staves. Big flavored rubs and barbecue sauces that run the gamut from coffee-flavored Java Rub (awesome on brisket) and our seriously spicy Steak Rub to our Lemon Brown Sugar Barbecue Sauce (which happens to be my family’s favorite). So you may wonder how we come up with new products and how we decide to add to the Best of Barbecue line and why. Well, one thing we do is monitor trends—and more important, we create them. Another is to think about the dishes we’ve been grilling a lot recently. And the tools that would help us prepare them better. This has been an incredibly busy year for Best of Barbecue, with more than 20 new products appearing in our 2014–2015 catalogue. I’d like to tell you about some of them and why they should be in every serious griller’s toolbox now. When it comes to flavor, nothing can beat the aromatic aroma of wood smoke. There are several ways to achieve it. One of the best is to toss soaked wood chips on the coals of your charcoal grill or add them to the smoker box of your gas grill. I discovered the sweet mellow flavor of maple wood during the taping of my Maitre du Grill TV show in Quebec. I came to appreciate fragrant cherry wood during my sojourn in the Pacific Northwest (hey, I went to Reed College in Portland, Oregon). So this year, we’ve introduced two single variety woods—Maple Wood Chips, which are great for smoking pork, duck, and cheese—and Cherry Wood Chips, which are killer for smoking salmon and poultry. While we’re on the subject of wood, I know you’re familiar with Cedar Grilling Planks for salmon. What you may not realize is that other hardwoods make great grilling planks—each with its own distinct flavor. Use our new Alder Plank for salmon, trout or Camembert cheese. Our new Maple Plank rocks the grill for shrimp or goat cheese. Our new Hickory Plank knocks grilled catfish or bratwurst out of the park. **Raichlen tip: Instead of soaking your grilling planks like we did in the old days, try grilling them dry to singe the wood before you add the food. You’ll get a much smokier, woodier flavor. Grilled quesadillas? Oaxacan grilled corn? We Americans have become obsessed with Mexican grilling. With good reason: Mexicans grill every imaginable food, from meat to seafood to veggies, harnessing the power of fire, smoke, and spice (especially chile peppers) to produce flavors that assault you like a charging bull. 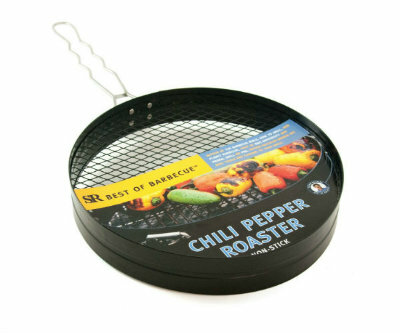 To help you grill like they do south of the border, we’ve developed three cool new tools: a wire mesh Pepper Roaster to help you flame roast poblanos, jalapeños, and other chiles. A Quesadilla Basket to help you grill (and more importantly, flip) that quesadilla without spilling the filling. And a Corn Basket to help you grill that corn for the mayonnaise and cheese-slathered ears that make Oaxacan grilled corn such a Planet Barbecue icon. 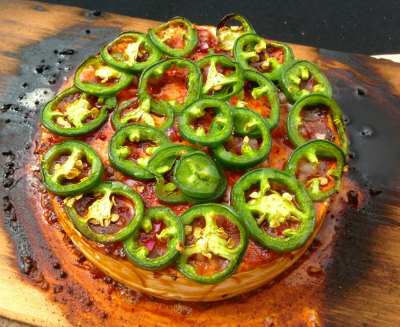 These days, grilled pizza follows a more traditional path, with the dough “baked” on a hot Pizza Stone positioned directly on the grill grate. Yes, you can toss wood chunks on the coals or in the smoker box to acquire some of the smoke flavor you’d get in a wood-burning oven. New this year is our Cast Iron Pizza Pan, which lends a coal oven crispness to the crust. Our Wooden Pizza Peel helps you slide the pizza onto the hot cast iron plate or pizza stone. 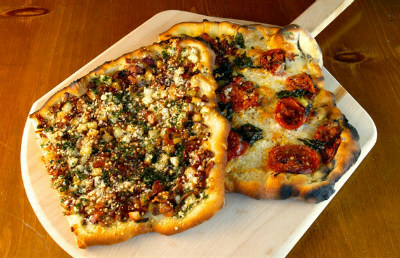 **Tip: Generously dust it with cornmeal to keep the uncooked dough from sticking. Use our new Rocking Pizza Cutter to cut your masterpiece into slices or squares. When pizza is this good, you’ll want to portion it with King Solomon-esque equanimity. Pulled pork may have originated in the Carolinas, but smoked shoulder torn into savory shreds has gone global. (Don’t believe me? Our Danish importer recently asked me to develop a Pulled Pork Rub for the European market.) The task just got easier with our Meat Claw set—sharp pronged claws with insulated handles that shred the meat in seconds. **Tip: To achieve shreddable tenderness, cook (almost overcook) the pork to 195 degrees. Combine them with our bestselling Insulated Gloves for handling the whole shoulder, All-Purpose Barbecue Rub, and Pork Smoking Chips (a blend of hickory, apple, and other woods) and you’ll smoke pork shoulder that would do a North Carolinean proud. Serve on our new Grilling Plate, which you can heat directly on the grill. 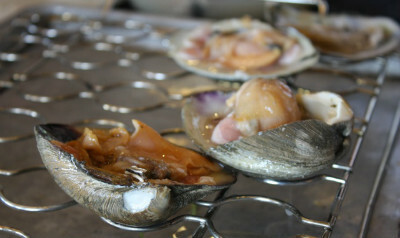 Living on Martha’s Vineyard part of the year, we eat a lot of oysters, clams, and other shellfish. Yeah, I like them raw on the half shell as much as the next guy. But I especially like them smoked or grilled. You’re probably familiar with my Shellfish Grilling Rack–which is designed for grilling oysters and clams without spilling the flavorful juices. 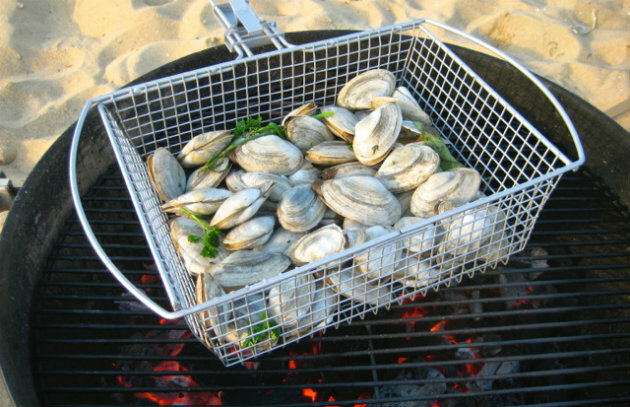 Well, our summer beach clambakes inspired a new product: our Shellfish Grilling Basket. Simply fill the basket with littlenecks, cherrystones, mussels, or—why not?—even shrimp in the shell. Add some sliced onions, lemon, and dill and grill over a driftwood fire, campfire, or your favorite portable grill. The best way to eat? With your bare hands, of course! 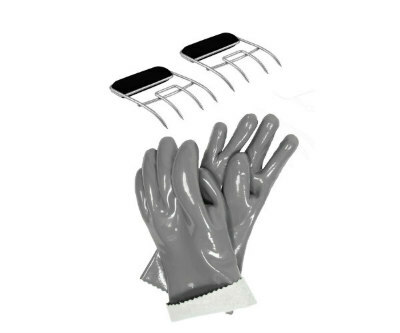 Next month, we’ll feature more new products specifically designed to help you with heat and temperature control. Visit the Steven Raichlen Store to see all of these products and more.